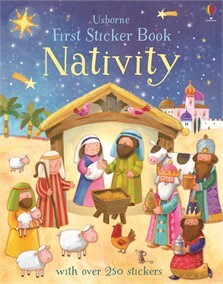 Little children can bring the Nativity story to life with this enchanting sticker book. There are colourful scenes of Mary and Joseph’s journey to Bethlehem, Jesus’ birth, the arrival of the shepherds and the Three Wise Men , and 230 stickers of people, animals and angels to add to the pages. A lovely introduction to the Christmas story.